Time to put the kids to work! 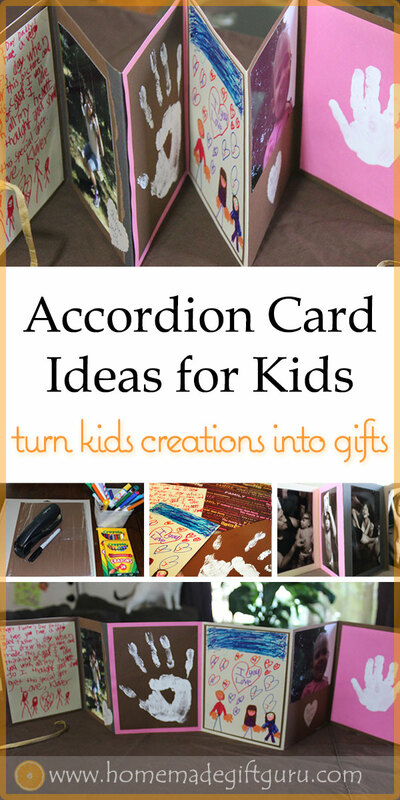 For these accordion cards, you'll give the kids everything they need to make an awesome homemade gift using paper, photos and their own personal art work. This meaningful homemade gift idea can be made by artists of any age, by simply providing the right art supplies for the child's age and by helping as little or as much as needed. 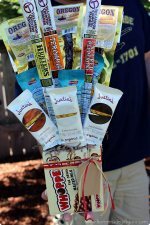 All you truly need to create a meaningful homemade gift for mom, dad, grandma, grandpa, aunt, uncle or anyone who truly loves things made by the little artists... is kids, paper and a little creativity! These "Kid inspired" accordion cards make exciting homemade Father's Day cards... and of course, they make the BEST homemade Mother's Day cards as well. 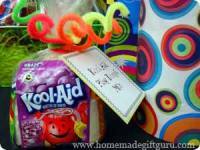 They can be given to Grandparents for birthdays as well as for Grandparents Day. 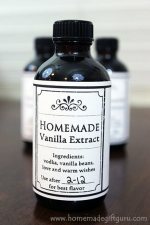 Thoughtful homemade gifts like these can also make amazing and memorable Holiday cards (Valentine's Day and Christmas for example) from the kids to their moms, dads, aunts, uncles, grandparents, even teachers. 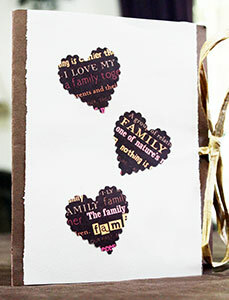 Making accordion cards is easy but filling them up with family memories and the kid's creations is the best part! There are a ton of ways to customize these cards, depending on the occasion at hand and who the gift is for. Below I've included a simple tutorial: How to Make an Accordion Card Base... but first, let's talk about the best part, what goes inside! This is the really great part where you can put the kids to work! Tips to consider... If your kids are very young, hand prints, fun photographs of the child, and possibly outlined words and images that they can color themselves, are going to be three of the best things things to try. My best tip for all this is to have the kids create their art separately, so you can trim it as needed and glue it in easily. I love the part when I get to take their individual art works and arrange them into the card until it has a look and feel we love! Various paper craft supplies for decorating the card... ex. scissors, decorative scissors, markers, stickers, stamps, ink, paint, scrapbook embellishments, poems, ribbon, paper cut-outs, scrapbook supplies etc. 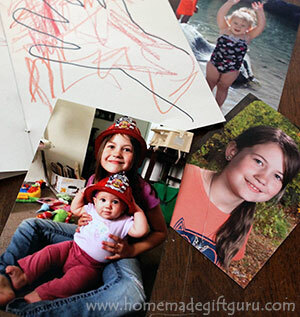 You also may want a few photographs of the kids to include next to and between art work pages. 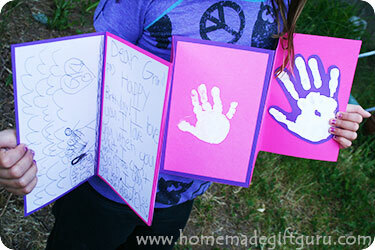 Depending on who your card is for, kids' hand prints can be a great addition to accordion book cards. Hand prints can be a little tricky, so I have my kids make their prints on a separate piece of paper and then I trim as needed and glue them inside when I'm ready. Much less mess this way! 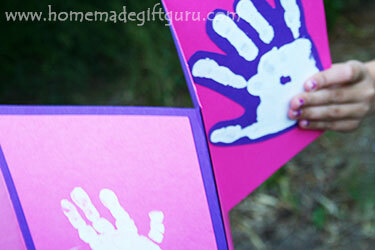 Watered down acrylic paint and non-toxic ink from a non-toxic ink pad are both great options for making hand prints. I've also simply outlined my kid's hands using a regular marker. If you want, you can have your kids color the outline in like we did below. Then put a picture of the child next to their hand print with the date. Pre-cut a few pieces of card stock 1/2" smaller than the card. Let the kid(s) go to town making special drawings and/or paintings for the card recipient. After they're done with their masterpieces, you can all choose favorites and then center and glue them as desired for a matted look. 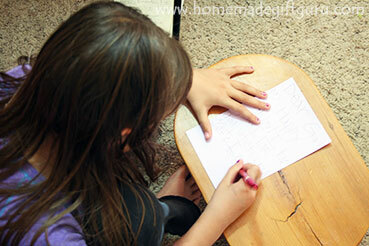 Kids can make their own hand written letters or you can write them for them using their own words. 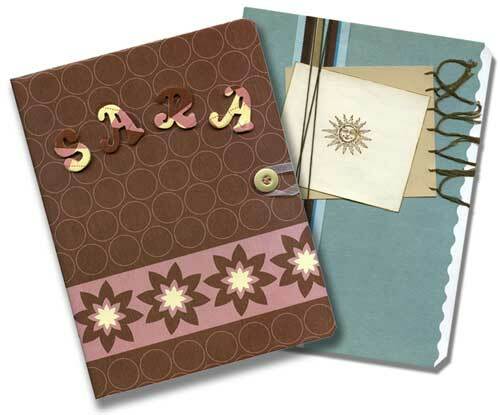 Hand-written letters are a great way to show you care and they go perfectly inside accordion cards. Place hand-written letters next to the author's own hand prints and photos for a meaningful effect. 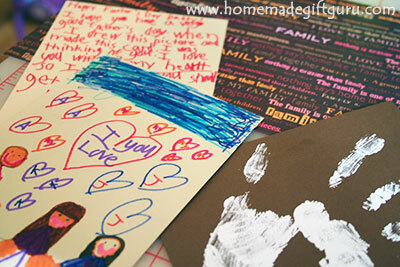 For hand-written letters, give the kids a piece of paper that will fit nicely inside the card once finished. That way they can write their letter to size. 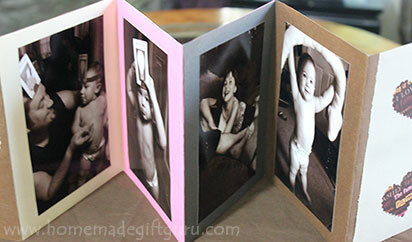 Photos will be an awesome addition to you accordion fold cards! Take fun posed photos special for the card or use photos from the past that match the theme. You can glue full size photos like I did here, or let the kids make photo collages using small photos or cut-out pieces from spare photos you don't mind them cutting up. For collages made by young kids, try cutting out a few fun images from your photos and let them arrange them how they like. If your kids are too young to make their own bubble letters, or their own festive images, try making the outlines yourself and letting them color them in. ...If it's a birthday card, you can outline, for example, the words "HAPPY BIRTHDAY!" using bubble style letters on the front of the card and then let your little artist enjoy coloring the words in exactly how they like. What do you plan to put in your cards? Let me know your idea here and I'll share it below! If you are wanting to make a simple greeting card using the accordion fold, you can take a 12" x 6" piece of paper and make 3 folds, one in the middle and one on each side. ...You can create different sized cards by varying the size of paper you start with and/or the number of folds you make. Because we like accordion cards with plenty of artistic space for the little ones to get creative, we opt for folding and gluing several sheets of card stock together to make one sturdy "mini-book style" accordion card. Start with at least 3 sheets of 8 1/2" x 11" card stock. 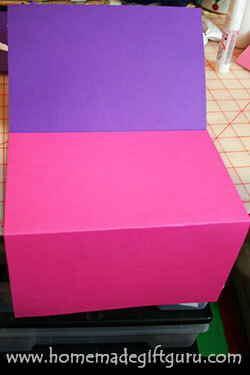 Take each piece of paper and (scoring first if necessary) fold them in half lengthwise. To create the accordion effect, alternate the papers... folded up connects to folded down connects to folded up as shown below. Once you are satisfied with the number of accordion book pages you've created, glue each half to the next half, alternating the paper folded up, folded down as shown. This makes a card that's 5 1/2" x 8 1/2". I like this size because it leaves plenty of room for photos and drawings by the kids. Want a different size card? You may choose to make your card a different size. This works just fine, as long as your cuts are exact, so that all of the pages line up perfectly together. You can of course use bigger paper for a larger card. The basic idea is pretty easy to adjust as you see fit. 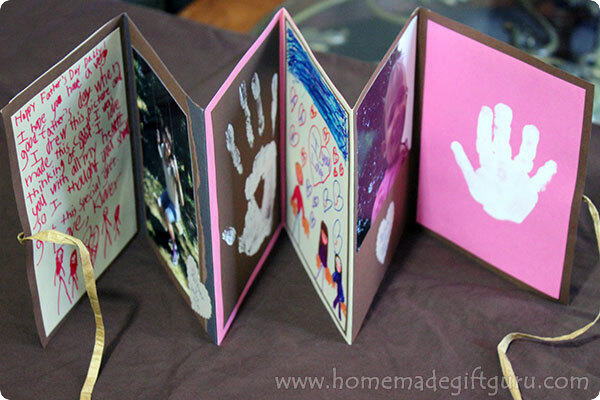 ...Once you have finished the card base, you can glue in all the hand prints and artwork your kids have made, alternating their creations with other fun stuff like poems and photos of the artists. After gluing in all the artwork and photos, you may want to further decorate your card, giving it the final touches. 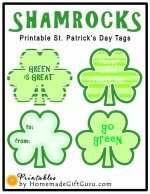 Whether you're decorating the whole thing yourself, sharing the fun with the kids, or allowing them to decorate everything themselves.... here's a few ideas for making your card even more beautiful. You and/or the kids can decorate your mini book-like card like a mini scrapbook using photos, stickers and flat scrapbook embellishments. Have the kids help you find meaningful things like poetry, greeting card phrases, quotes, affirmations or bible versus to include between photos, drawings and hand prints. 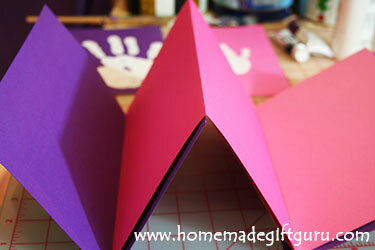 There are a few creative ways to keep accordion book cards shut. One way to make a cute closure is to glue a piece of ribbon or raffia between both the front and back covers and whatever you glue on top and bottom. 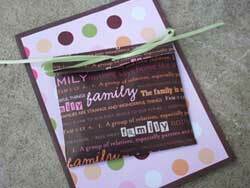 Allow each ribbon to stick out a few inches so, once closed, the card can be tied shut. You can also glue a large button to the front of the card and make a loop, coming from the back cover, to wrap around the button. These accordion cards make great homemade gifts. If you want to give something additional that goes inside the card, why not make a pouch out of paper and place it on the last page of the card. Slip in a homemade gift certificate, movie tickets, concert tickets, tickets to a play or a gift card for coffee or dinner. Write a meaningful note around the pocket such as, "Movie Tickets for the world's BEST Grandparents!" or "HUG COUPONS FROM _____"
I love that you don't have to be an expert in card making techniques to create a great homemade accordion card gift. I say that from factual experience. After seeing the kids and I make several accordion cards over the last few years, my husband actually made me one. I have to say, it was quite a treat! Share photos of your accordion cards here! Guess what makes these playdough kits both vibrant and budget-friendly? 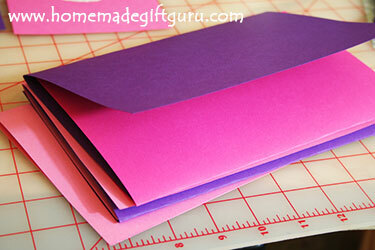 This free template makes cute pockets for your homemade greeting cards!